I wanted to get information on my terminal on Ubuntu. y requirement was that, any data that i wanted should be output on the terminal itself. I didn’t want to open a browser each time i wanted some information. And all I needed was the data and not images and videos. So to view the information on the terminal was very convenient and efficient. When i searched, I was looking for a python implimentstion , i came to know that using Wikipedia API, one can to send a http request to the website as a query action and json format and get the json object. This could be implemented using the request , module in python. So this would give the json object that had the data on the topic to be queried. The next step was to parse it . And I found that Beautiful Soup can be used to do that so extract only the data. This was one of the best options available . An then the only thing to do was to print the data that is extracted. I found 2 scripts to do just that. These scripts however dont use Requests module but use urllib and urllib2. The advantage of using this is that, only a brief summary of the topic under search will be showed. And most of the time it is the only thing we want. The second thing is that if there are sections in the topic, it will be shown. What this lacks is that, it does not have a good pattern matching for searches, that is if it doesnt ind the exact words in the article it will not be returned. This also happens if each result has multiple result. Sometimes the data returned is either very less or a lot. 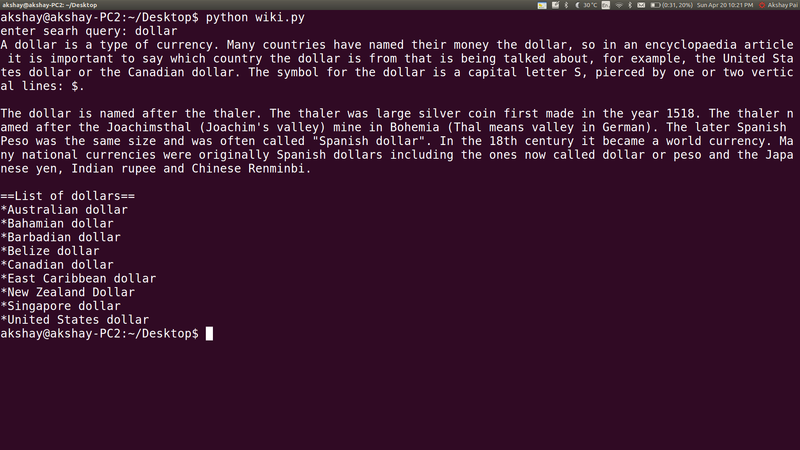 First download and save tehse 2 python files. 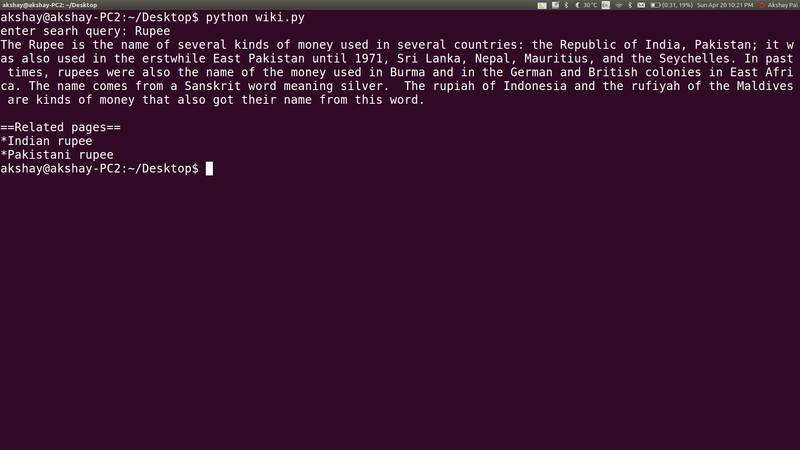 Then create a python file and name it wiki.py . Then paste the following script in it. Enter the search term and get the results. I have the follow mistake, I how solve this ?? the error has occurred because you have not installed the yaml module.